Reading On Paper or On Screen: Are We Developing “Bi-literal Brains”? Are the universe of desk-bound and mobile devices and the ubiquity of their screens having an effect on the processes and neurology of the way we read? If so, how does reading on a screen as opposed to reading on paper influence our navigation, comprehension, retention and enjoyment of all of these words we consuming? Recently, these fascinating and persistent issues were taken up with some new perspectives and heightened interest in a podcast and an article. I highly recommend clicking through to them if you have an opportunity to do so for their deep and wide insights into the ongoing evolution of reading. First, is the podcast entitled The ‘Bi-literate’ Brain: The Key to Reading in a Sea of Screens, posted on September 17, 2014 on the New Tech City blog hosted by Manoush Zomorodi on WYNC in New York. In her interviews with several experts, the emerging concept of the development of the “bi-literal brain” is explored. That is, how reading on a screen, so distinctly less linear than traditional reading on a printed page, is thus causing the appearance of new adaptive changes in our brains. Second, in a thought-provoking article about the benefits of setting time aside for uninterrupted reading, preferably on paper, entitled Read Slowly to Benefit Your Brain and Cut Stress, by Jeanne Wahlen, appeared in the September 15, 2014 edition of The Wall Street Journal. This report covered the recent formations of local reading clubs around the world where people gather in quiet and comfortable places to spend an average of an hour or so just reading print materials without any interruptions. Attendees spoke of the great virtues of quiet and concentration that helped them to relax a bit and process their printed texts more fully. The author makes a comparison of this form of “slow reading” to the culinary process of “slow cooking“. * This story also contains a very informative and persuasive graphic that lists the process tips and health benefits of dedicating time to nothing but reading. Upon both listening to the podcast and then reading the article within 24 hours of each other, I was reminded of another very enlightening article I read entitled The Reading Brain in the Digital Age: The Science of Paper versus Screens by Ferris Jabr in the April 2013 issue of Scientific American. This piece likewise examined the very same issues of how digital technology is affecting our reading mechanics and, in turn, the longer-term neurological implications. The author summarizes and sorts through some of the leading research in this field, highlighting the areas of agreement and inconsistency in the results. ** Paper gets the edge here because, to greatly simplify the detailed findings so eloquently presented in this article, it better enables the reader to navigate the text by proving a physical sense of where they are on the page and in the entire body of the text, improves retention rates, and it is easier on the eyes. Even the actual weight of printed material has its benefits. Does the availability of Google and other search engines change what is “information” and how it is transformed into “knowledge”? Is exercising and relying upon one’s memory thus less important if we can quickly do a search anywhere about anything? If indeed “bi-literal brains” are a genuine phenomenon, are there currently resources and skills available to improve and cross-train both sets of skills while minimizing their negative effects? Might there be some new entrepreneurial opportunities awaiting here? Whether and how should content creators, content strategists and content publishers continue to adapt to these changing environments? * I hope that no one out there accidentally gets these concepts confused because this might lead to having to eat your your own words. ** Maryanne Wolf of Turfts University was interviewed for both the WNYC podcast and the Scientific American article. 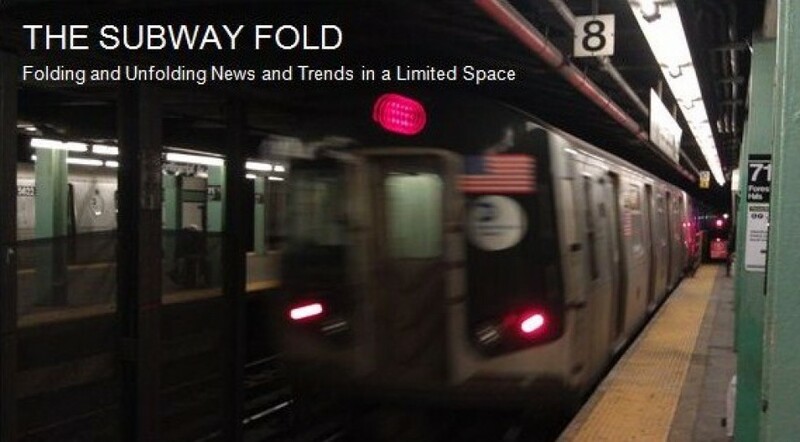 This entry was posted in Books, Movies, and Music, Media, Medical and Biotechnology and tagged Benefits of Slow Reading, Bi-lateral Brain, Deep Reading, Information Versus Knowledge, Maryanne Wolf, New Tech City, Print Versus Screen, Reading on Paper, Reading on Screen, Slow Reading, Subway Fold, Tufts University. Bookmark the permalink.